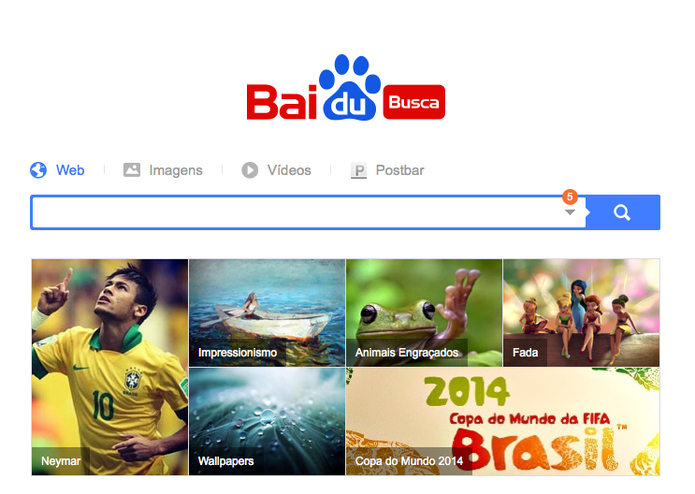 IWASSA Co.: Baidu brings to Brazil the 2nd largest search engine in the world to take on Google. Baidu brings to Brazil the 2nd largest search engine in the world to take on Google. for Brazilian users with new social features. The announcement coincided with the 40th anniversary of the establishment of diplomatic relations between Brazil and China. Among the new features are a kind of timeline and the so-called "Smart Searchbox" that can predict search queries from users before you even finish typing. The same function automatically displays the most relevant content considered directly in the search box - reducing the path and the amount of clicks to the result. Li sought in Portuguese, the words "China Brazil". The results showed a picture of the flags of both countries with the words "40 years of diplomatic relations: Brazil-China", along with a list of articles about the common history of the two nations. The Brazilian version of search engine also offers social functions and allows "like" to be more relevant results directly on the search results page in Postbar network. The new search engine can be accessed at br.baidu.com address. The baidu.com link remains in Chinese. Baidu is a threat to Google? Comment on the TechTudo Forum. Since 2013, Baidu has been working in Brazil and bringing a range of products with local versions. The first list featured the nine services to Portuguese but curiously left out your search. Meet other services that have been translated into Portuguese and test its functions.